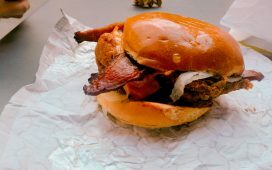 Duluth is rapidly becoming a great hub for international eateries and cafés in Gwinnett County. This is because of its rapidly growing Asian and Indian community. 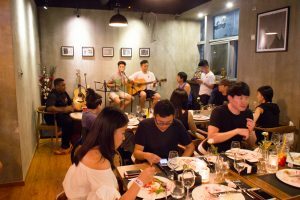 Nowadays, you can find the Korean, Chinese and Vietnamese café’s on every corner and try foods that you would otherwise have to travel to Asia to experience. 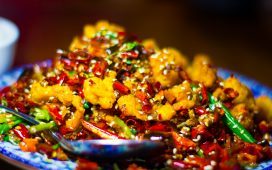 Having traveled through Asia, I have noticed quickly many desserts, coffees and café styles hitting the streets of Duluth. There is a particular dessert that I have recently come in contact with that is extremely popular in Korea which is Waffles. 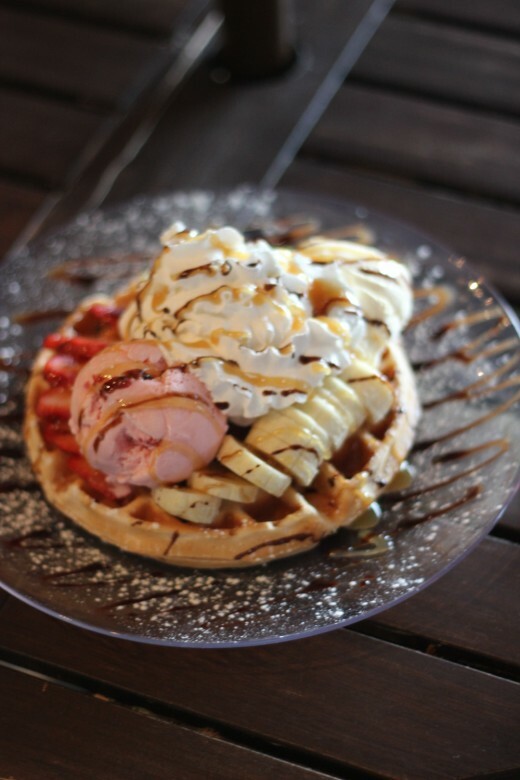 Yes, waffles are more than just a breakfast item paired with eggs and bacon – but in Korea; they are a dessert item combined with ice creams, whipped cream, fruit, honey syrup and all kinds of great toppings called wangpul in Korean. If you’re walking through the streets of Korea, you will find that a popular street food are waffles that have been covered in flavored syrups. They come flat on a plate, folded (typically if sold on the streets) like a sandwich or long (longful waffles) filled with your choice of ice cream, fruit, etc. Although this sounds a bit strange and edgy, it is definitely worth a try if you find yourself roaming the streets of Korea. Let’s say your reading this and you are wanting to try this out but don’t necessarily have the time to travel to Korea, I got just the place! 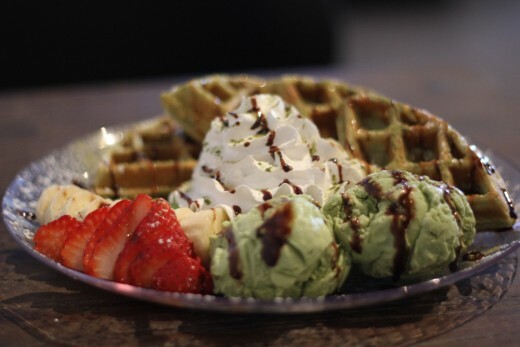 Arte 3 was one of the foremost Korean café’s to introduce dessert style waffles to Gwinnett! Owner Misun Goh moved to America eight years ago from Korea. She saw the opportunity to bring the same desserts to the Duluth area that are served in Korea. From this passion, she took ownership of Arte 3 and began her process of bringing Korean street food to Duluth, GA. What is unique about these waffles is the fact that the batter is made in house and you have the ability to choose how your waffle is made. There is the original waffle (my personal favorite), green tea waffle, choco, fruit choco, and cinnamon waffle. These are plated waffles covered in every form of goodness and definitely something you may want to share with a friend (unless you just really are having a desert chow down moment). My first time trying a waffle here – I fell in love with the original waffle (photo on right). 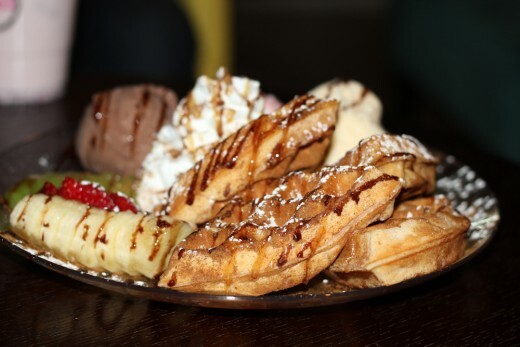 Dessert toppings aside – the waffle was just an amazing waffle – period. I think I mentioned to a worker there that I would love to come back just to purchase a waffle. This house made waffle was covered in kiwi, bananas, strawberries, green tea ice cream, and vanilla ice cream. Let’s not forget its topped with whipped cream and multiple flavored syrups. Landing in front of me I had wished I had help but the experience was one I haven’t had in a long time. If eating a waffle covered in the desert seems strange to you, think of a flattened waffle cone that doesn’t have to drip all over your clothes while you eat it because it’s served on a plate. Bingsu – Korean Shaved Ice Dessert! On top of amazing Korean waffles, there are other desserts here that are popular in Asia and rival your American desserts with a unique creativity and taste. One of those growing trends in Korea is a dish called Bingsu! Bingsu is a popular Korean summer dessert featuring shaved ice topped with anything from fruits, nuts, ice cream, cookies or red beans. Believed to date back all the way to Joseon Dynasty, the original bingsu was simple, served s finely broken ice chips topped with sweetened red bean porridge. 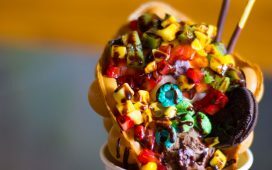 Thankfully today many bingsu dishes shy away from that bean taste and have evolved into countless combinations of dessert toppings. 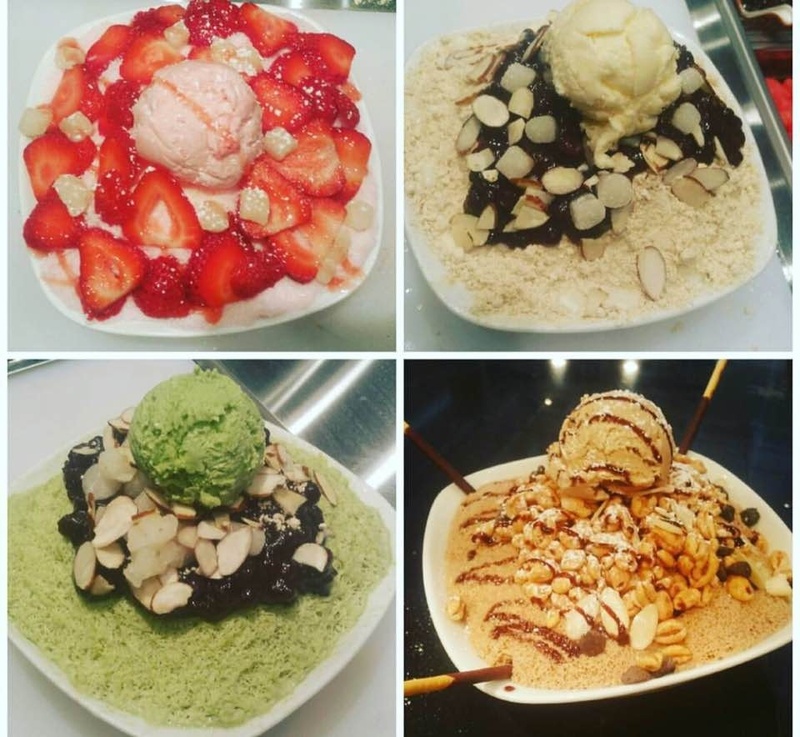 Almost any café in Korea will have a type of Bingsu to offer and toppings from squash, to red beans, to fruits/nuts! That said, Misun has brought this much-loved dish to Arte 3 as well. 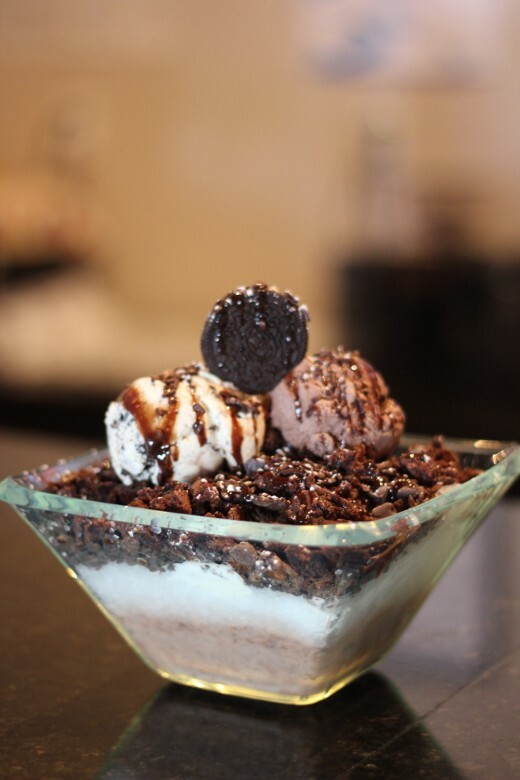 Their dishes are pot bingsu, fruit bingsu, coffee bingsu, and green tea bingsu. Each dish has its own unique toppings! If you’re looking for a great ice cream substitute, this should be at the top of your list! Speaking of bingsu, while I was in China, I noticed a new type of bingsu that was very popular. This type, instead of having sweet toppings over ice, used flavored milk shavings instead. That said, you get a better experience in my opinion because your eating the toppings of the bingsu with the “snow” which is also flavored and sweetened. Upon getting back to the states, I noticed that they also had this option which is pretty awesome. Another popular street food in Korea that is a must try is called Fish Ice Cream! Before you close this article, you need to hear me out. This is NOT fish flavored ice cream but rather it is a popular fish-shaped pastry called Bungeoppang. This is a soft waffle-like pastry that is shaped into a fish with its mouth open. 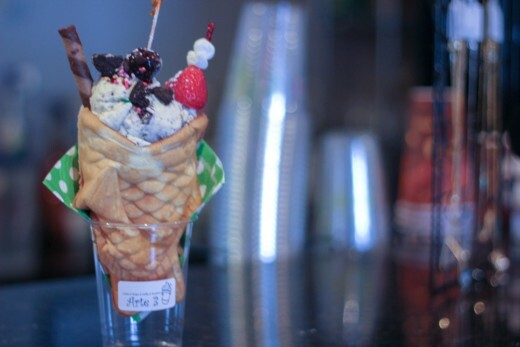 Your choice of toppings are added to the base of the cone and it is filled with ice cream and multiple toppings! My first time hearing of fish ice cream I was a bit thrown back myself but I love the pastry – it’s a thicker pastry to it gives a better experience than your typical ice cream cone. I personally recommend the custard filling. On top of the amazing desserts, Misun has also introduced some amazing drinks. 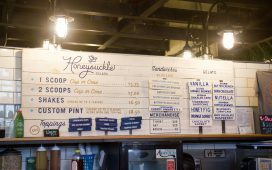 Known for their iced Korean coffee (which is a sweet espresso style coffee), they offer many other dishes that are hard to find in your usual café. One of my favorites is the Macaroon frappe. 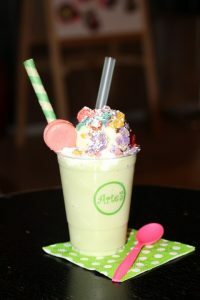 The macaroons are made in-house and combined with your flavor of frappe and topped with pieces of macaroons, a candy straw and a ton of goodness that’s hard for me to describe. You’re going to have to just take it from the photo below that this is an amazing dessert drink. There are also multiple lemonades that can be purchased in a mason jar to take home or as a drink. These are the pomegranate-aid, grapefruit-aid and lemonade – all made in-house by Misun and totally delicious. These same flavors can also be tried in their house-made teas. What brought me back to this café was simply the watermelon juice, which was my first purchase here. When driving by Arte 3, you may have wondered what type of café it is as I have. Once walking inside, I was thrown off by how large it was (definitely bigger on the inside). It has a model interior that is totally inviting for anyone who wants to relax on one of the couches or experience their dessert experience on a table or booth. 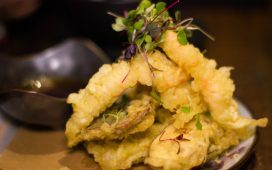 Walking in, you’re sure to experience a Korean culture before finding yourself in front of the large rounded menu. K-POP music videos are playing on the front and back of the café expanding the cultural experience. The modern furniture, Asian drinks, and Korean/English menu give a well-rounded atmosphere to introduce you to a classic Korean café while saving you the airfare to Korea (although I totally recommend the visit). Misun wanted to create a café that was open for big groups, individuals, study groups or anyone wanting to relax and experience Korean desserts and drinks. I believe she has successfully pulled this off by offering a comfortable atmosphere, great desserts, and unique drinks! If you are in the Duluth area or live anywhere around Gwinnett County, you owe it to yourself to stop by Arte and try one of these amazing desserts! WE WILL BE DOING A MEETUP HERE ON THE FIRST OF OCTOBER.